A building owner’s legal challenge threatened to delay new regulations on short-term rentals, so a City Council member gave the building a special break. The regulations are set to take effect next year. Eric Friedland owns a building with apartments that he rents out on Airbnb, as does William McClelland. 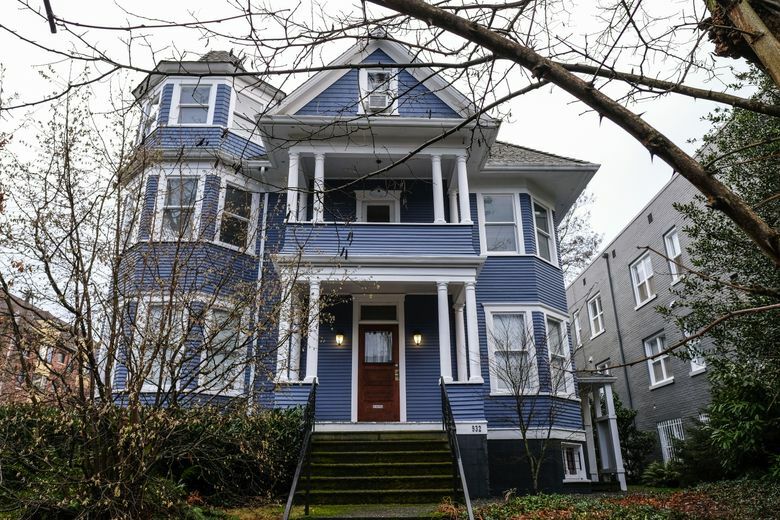 Friedland opposed new regulations on short-term rentals that the Seattle City Council voted to adopt in December because he knew they would cut down on his business. So did McClelland. But when the regulations kick in, Friedland will be able to ignore the most important restriction. McClelland won’t. That’s because the council, rather than slow down to wrangle with Friedland’s lawyer, made the building owner a special deal — one that shows how city politics can be played. In return for Friedland’s dropping his legal challenge, the council included an exemption designed just for him. Tim Burgess, the now-retired council member and mayor who initially agreed to the deal, viewed it as a means to an end, allowing a new policy to move ahead. Starting in 2019, the regulations will require landlords to obtain short-term rental licenses and bar most of them from operating more than two units — something that Burgess and other proponents contend will help preserve Seattle’s housing stock for locals. Friedland will be allowed to continue operating all the units he does now. “You have to look at the outcome that we achieved,” Burgess said. 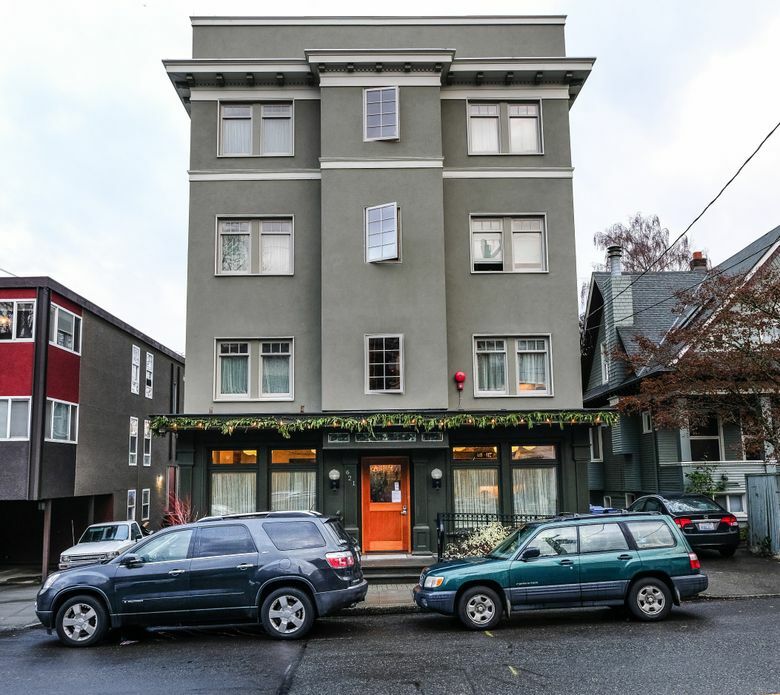 Friedland and his wife bought property on Capitol Hill and constructed their building a few years ago with 39 micro-apartments — with a shared kitchen on each floor. From the start, their plan was to operate short-term rentals. A doctor by trade, Friedland believed the building would appeal to traveling nurses and visiting medical students. It now serves all manner of guests, including those groups, who book the studios for under $100 a night on Airbnb. “I picked this place for the location and price,” explained Emily Weber, a graduate student from Chicago who was staying there last week while visiting Seattle for an internship interview. When the council began considering the new regulations in 2016, Friedland thought it would be unfair for City Hall to shut down what had been a legitimate business. So he contacted multiple council members, meeting mostly with their legislative aides. Friedland told them he and his wife had spent $3 million on their project and were providing a desired service. He even paid an experienced lobbyist to help sway the council members. But Friedland says he didn’t get much traction until he hired a lawyer from a top land-use firm who knew the ins and outs of the state’s obscure environmental-review process. When city officials determined the proposed regulations wouldn’t harm the environment in any significant way, Friedland’s lawyer helped him appeal that decision, filing a case with the Seattle Hearing Examiner. They called the decision flawed and argued the regulations would hurt not only Friedland and his wife but short-term rental operators in general, while negatively impacting Seattle’s housing and traffic. The city sought to have the challenge dismissed immediately, but the hearing examiner’s office refused. The case was set to continue for at least three months, Friedland said. “They came to us and said, ‘Let’s negotiate. We want to pass this legislation,’ ” Friedland recalled. Then, the city’s lawyers huddled with Burgess to discuss the potential deal. The unusual deal looked like this: If the council’s housing committee passed the regulations with a clause allowing Friedland to continue operating all of his short-term rentals, he would drop his appeal. There was no guarantee the full council, in taking a final vote, would maintain the exemption; Burgess says he didn’t want to promise that. The committee passed the new version on Sept. 15, and on Sept. 21, Friedland’s lawyer withdrew the case. A group of short-term rental operators using the same lawyer as Friedland agreed to drop their own appeal in exchange for an exemption in and around downtown. Part of the rationale was that downtown had long been a hotel zone, Burgess said. Michelle Acquavella, who helped organize the group — called Seattle Short Term Rental Alliance — said her initial goal was to get existing operators everywhere in the city grandfathered in. The downtown carve-out was a compromise, said Acquavella, whose company leases and manages a number of short-term rentals in the area. “I tried to save as many as I could,” she said. The next step in the process didn’t go completely according to plan. Before the full council voted, Burgess became temporary mayor. Then the council, with Burgess gone, decided the regulations needed more work. The final vote didn’t come until Dec. 11, and operators with units in Belltown, Uptown and South Lake Union saw those areas whittled away from the downtown exemption zone after a lively debate among council members about whether it made sense. Friedland’s exemption received no such discussion, however, and it survived. 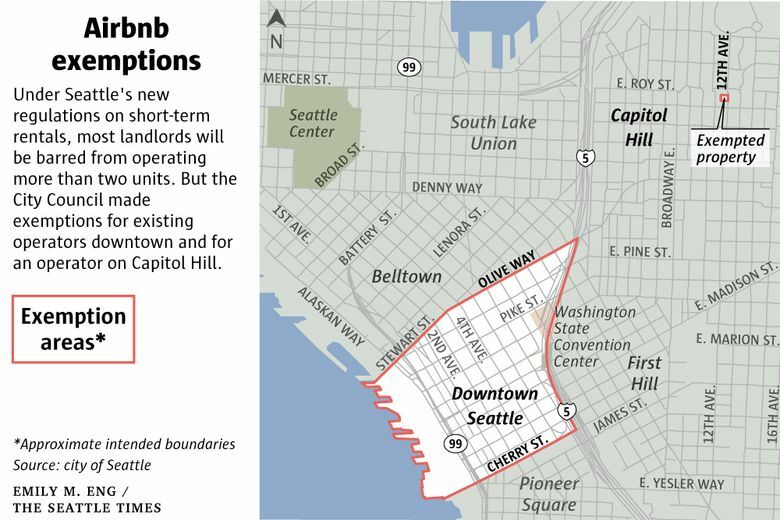 It applies only to certain buildings constructed after 2012 on Capitol Hill and First Hill with units operated as short-term rentals prior to Sept. 30, 2017. Buried deep in the ordinance that passed with a 7-0 vote, the so-called carve-out could easily be overlooked. When Councilmember Lisa Herbold voted, she thought only the downtown core exemption remained, she said. She didn’t realize Friedland’s had survived. Theoretically, the exemption could apply to some buildings other than Friedland’s, but Burgess said he doesn’t know of any. The way the regulations were written bothers McClelland, who’s been operating three short-term rentals in a Central District Victorian for about eight years. His guests have included parents visiting their adult children, cast members from traveling theater shows and visiting professors, he said. It’s not so much that he resents Friedland. It’s more that McClelland wonders if this is how government is supposed to work. He knew about the Short Term Rental Alliance’s efforts but didn’t know he could file an appeal of his own and couldn’t have paid, anyway. “It would have cost a lot,” he said. Councilmember Rob Johnson, who inherited responsibility for advancing the short-term-rental regulations after Burgess became mayor, didn’t like the carve-outs. But other council members, wary of watering down the regulations, chose not to back Johnson. As for the Friedland exemption, “I wasn’t the person who cut that deal,” Johnson said. Burgess says he can see why the deal would make some people upset, and he says the ability of interested parties to block policies with legal challenges can be aggravating. But he calls the environmental-review system “one of the key checks and balances on the city’s political process,” and he says the city’s lawyers regularly manage risk by recommending settlements. In a Dec. 15 letter, new Mayor Jenny Durkan said she’s concerned “the complexity of the regulations … may inhibit compliance” and place too heavy an administrative burden on city bureaucrats. As for Friedland, he says he’s no different from others with reasons to care about policy made at City Hall. The hotel industry, which competes with short-term rentals, has donated to the campaigns of council members, including Burgess, Friedland noted. Puget Sound Sage, an advocacy organization that pushed for the regulations, is aligned with Seattle’s hotel-workers union. Airbnb spent $56,200 lobbying city officials in the first nine months of last year against more restrictive regulations. Friedland says he only did what he had to do to protect his business. For example, even after dropping his legal challenge, he had his employees call and meet with council members.